The next-generation Porsche Cayenne could go the fully electrified route, at least where internal discussions are concerned, Auto Express says. The German manufacturer recently confirmed that the next-generation Macan will become a fully-electric model, joining the Taycan and Taycan Cross Turismo in the pure EV ranks. “This decision is not made yet. But of course, we’re discussing the future of almost every model, because many markets are asking for electric cars,” a Porsche spokesperson told Auto Express. Cayenne-specific considerations are naturally some distance away, as the E3-generation model had only been launched in August 2017, and the SUV will be a standalone model should it go the pure EV route. “When we do a fully electric car it has to be designed purpose built for electro-mobility, like the Taycan. I’m not a fan of doing everything in one car because our vehicles are high performance and to achieve that with multi purpose powertrains it is not possible,” said Porsche CEO Oliver Blume. This could lead to Porsche putting the dedicated EV Cayenne on sale alongside the existing internal combustion engined version, the report said, in order to cater for markets which may not be switching to electric drive as quickly as others. “The first steps for the next decade, we have to have in every segment, in our sports car, limousines and SUVs, an offer of a petrol, hybrid and full electric car,” Blume added. 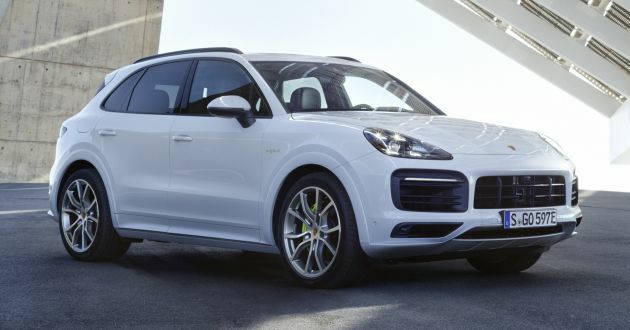 The latest addition to the Cayenne range is the Coupe bodystyle, which has launched with 3.0 litre turbo V6 and 4.0 biturbo V8 engines, though there is scope here for the inclusion of electrified powertrains later on. This goes head-to-head with the likes of the Audi Q8, Mercedes-Benz GLE Coupe and BMW X6. The post Porsche Cayenne EV under consideration – report appeared first on Paul Tan's Automotive News. 0 Response to "Porsche Cayenne EV under consideration – report"